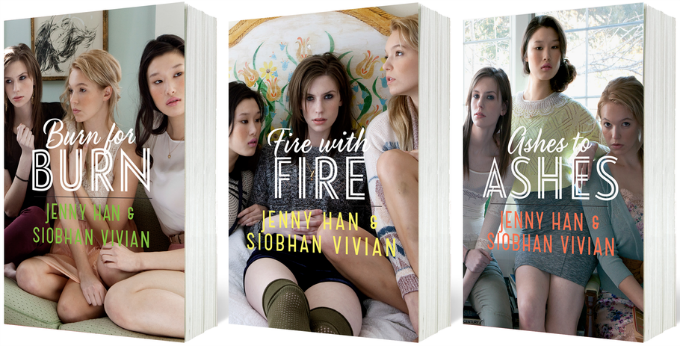 I can not say enough nice things about the Burn for Burn trilogy, by Jenny Han and Siobhan Vivian. But I’m going to try. These books are funny, quirky, romantic, thought-provoking, suspenseful, and heart breaking. The characters are relatable and grow throughout the series … some in ways that I promise no one could have imagined. The books deal with issues of race, social class, sexual assault, grief, bullying, and betrayal without being issue books. They also deal with boyfriends, best friends, fashion questions, lip gloss flavors, gossip, jealousy, and school dances without being frivolous. Ashes to Ashes is no exception. This book is a good continuation of the story, because it stays true to the characters – Kat, Mary, and Lillia – while also completely raising the stakes and upping the tension. The authors obviously plotted out each point of this series and know the girls very well. The series started as a very well done girly, high school story of friendship, but by book three the book is straight up paranormal suspense. And somehow it just makes so much sense. I’m not going to say that everything worked out exactly the way I wanted it to (wouldn’t that be nice in books and in life?). But raced through the pages to find out what would happen, and once I finished I felt the emotional weight of the story pressed against my chest. Here is a link to the goodreads summary, which (warning!) does have spoilers for the first too books. Big big book altering spoilers. If you haven’t started the series I recommend beginning with book one, obviously, and if you have let me know what you think of the books in the comments. Especially about the epilogue (try to keep it spoiler free). I’m not going to lie, I had a heavy heart full of mixed feelings when I read those final pages. This entry was posted in Uncategorized and tagged Ashes to Ashes, Book Reviews, books, Burn for Burn, Jenny Han, Siobhan Vivian, YA Books by Alison Doherty. Bookmark the permalink. I agree with everything you said – this has been my favorite young adult series. Han and Vivian did something neither Veronica Roth nor Suzanne Collins managed to do – write a complete series that kept building until the end. After reading this it looks like my “To Read” pile will be getting three books higher very soon!